The backsplash of the kitchen doesn’t necessarily have to be a standout feature of the room. You can even have a finished kitchen without a backsplash. If you’re looking to refresh the look of the space or plan to remodel the entire kitchen, adding some style to the backsplash represents a great solution. This area provides a nice opportunity to add a creative touch and complete the overall design of the kitchen. Countertops, flooring, and cabinets don’t offer the same kind of flexibility when it comes to adding a more personal touch to the kitchen. This is why you can successfully turn to the backsplash for a bit of customization. 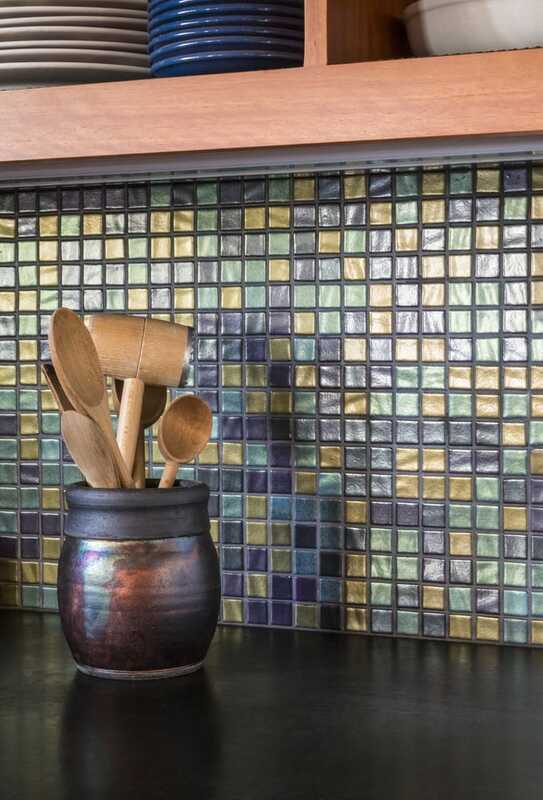 The backsplash can be decorated in multiple ways including through bolder colors or interesting patterns. This space has a functional role and you can take it out in the spotlight by giving it a more aesthetic purpose. Check out the following creative ideas to decorate the kitchen backsplash and add some fresh style and drama. With the help of natural stone, you can give the backsplash a more pleasant texture which contrasts nicely to the smoothness of cabinets. A stone backsplash is a stylish option to consider, though keep in mind that it’s a bit more difficult to maintain compared to other choices. If you don’t like the idea of using smaller, stacked stones, there’s always the option to build on the design of the countertop and keep going with the same granite or marble texture up the wall. An exposed brick wall offers a great opportunity to enhance the look of any kitchen. 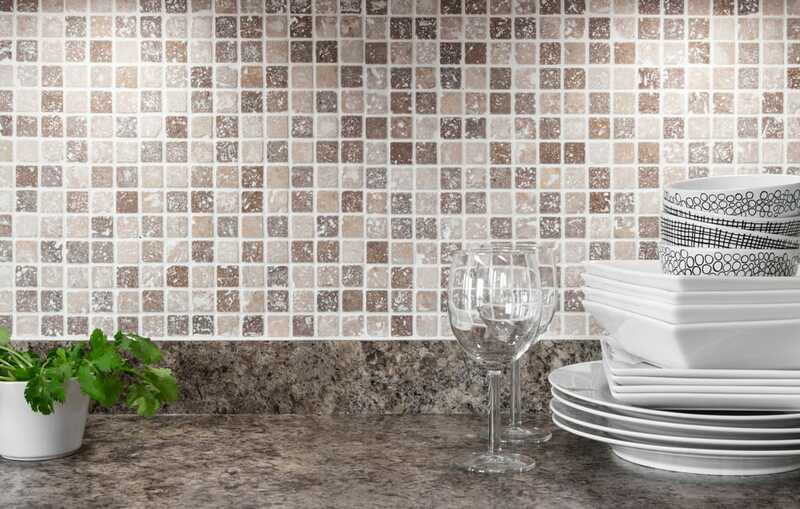 By creating a brick backsplash you can make the kitchen feel more inviting. There are lots of customization options in case you wish to match the look of the bricks to the design of the overall kitchen. 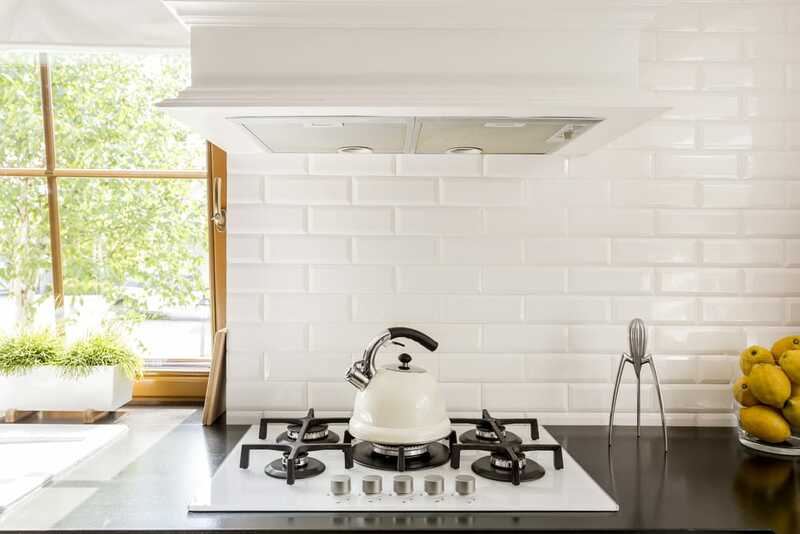 A predominantly white kitchen can take advantage of a painted brick backsplash. Similar to stone, brick may pose some difficulties with cleaning, and that’s why we recommend using a quality sealant. Mosaics are known for being able to add visual interest to lots of design elements. The backsplash can make great use of this pattern considering how this is an area that’s often overlooked in the kitchen. 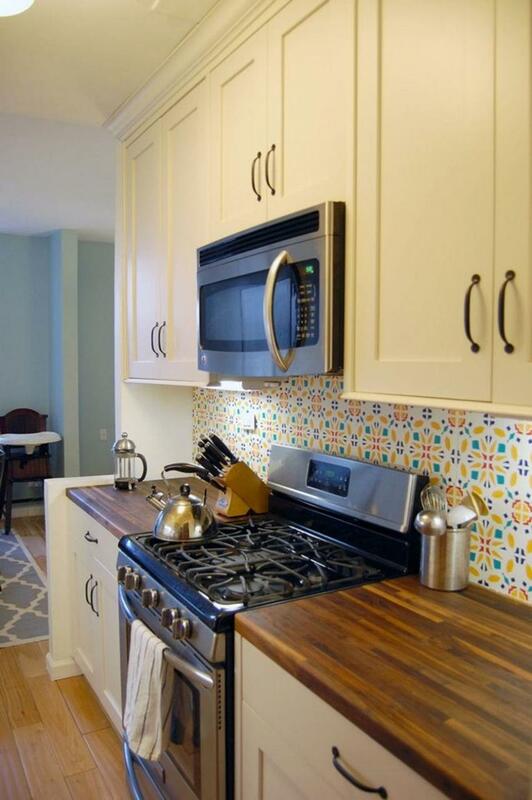 While respecting the overall color scheme, you can incorporate some beautiful mosaic backsplashes with some creative patterns. Making a focal point behind the stove is a good example if you wish to transform the look of your ordinary kitchen. For a modern look that’s memorable and pretty, go for a granite backsplash. The mixing of grey and white colors on this backsplash create a pleasant visual effect in a more minimalist kitchen. It’s definitely more exciting compared to using plain solid colors, but at the same time, it won’t stand out too much compared to the rest of the kitchen elements. Patterns can come in many forms and shapes to add a bit of interest to a key area. Given the connecting nature of the backsplash, as it represents a stepping stone between countertops and cabinets, this is an ideal spot to introduce some playful patterns. Simple horizontal lines in different colors should be enough to add some spice to a modern kitchen. If you’re feeling more creative, you can incorporate more complex patterns that will draw even more attention to the backsplash. 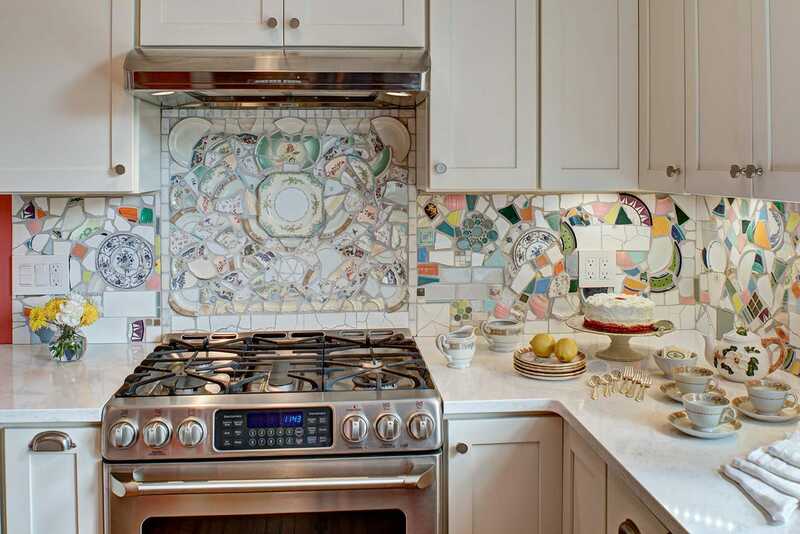 Glass tile in a mosaic pattern seems like a popular option to rejuvenate the look of the kitchen backsplash. 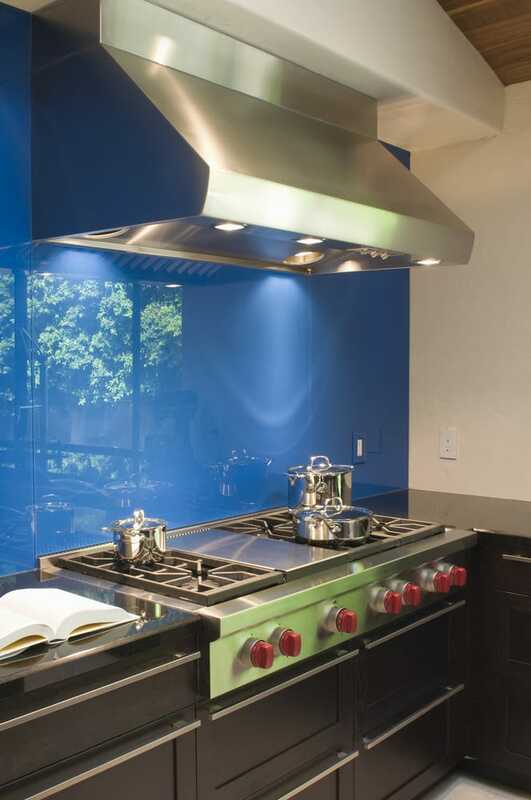 The combination of vibrant colors with the glass texture makes for a great addition to your kitchen. To maintain a visual balance, consider decorating with accessories on countertops that have a similar look. Marble is a stunning material to use for the backsplash considering the powerful visual impact and low maintenance. The only downside is that it can get a bit expensive and will require a professional to help you redecorate the kitchen. 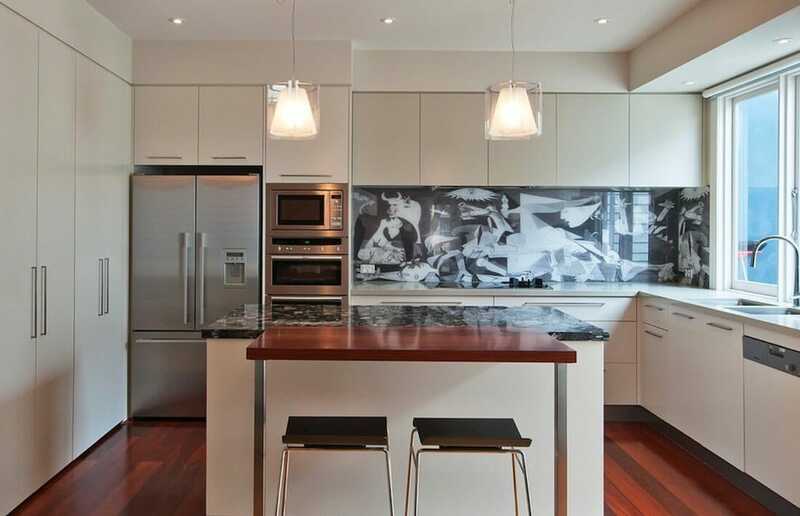 One great advantage regarding marble backsplashes is that they’ll most likely never go out of style. When you choose a marble backsplash, make sure it matches well the look of the countertops and cabinets. A completely white kitchen can easily become boring. The simplest way to add some excitement is with the help of a splash of color. Here we have a red backsplash in the kitchen that creates a memorable contrast providing an ideal background for the white elements in the room. 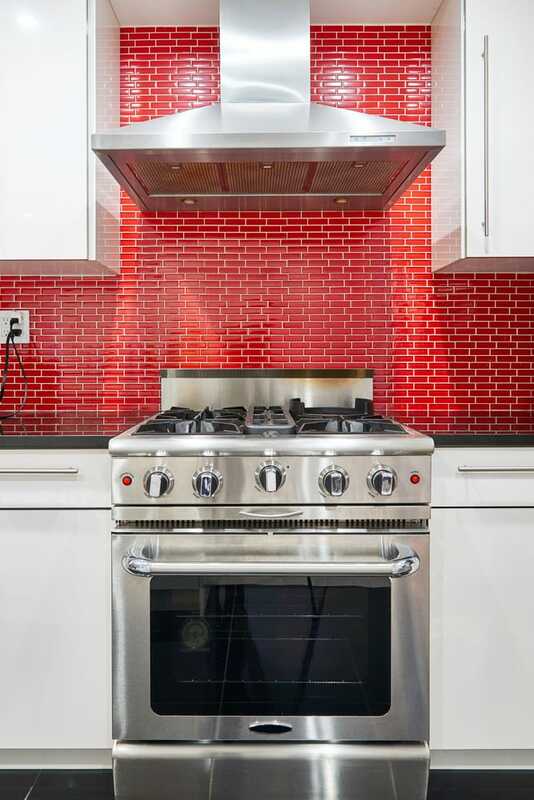 The silver stove and range hood seem to stand out some more thanks to the fiery red color of this backsplash. 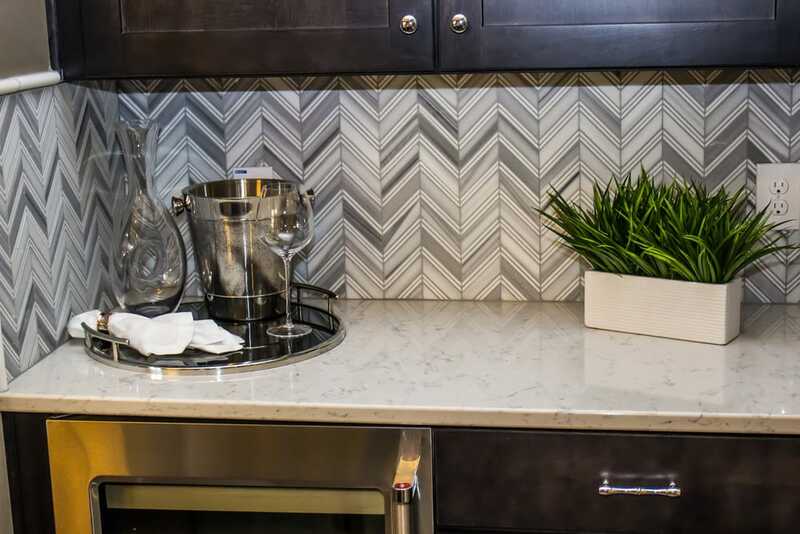 Chevron is one superb choice to decorate a kitchen backsplash if you like the idea of integrating some patterns. 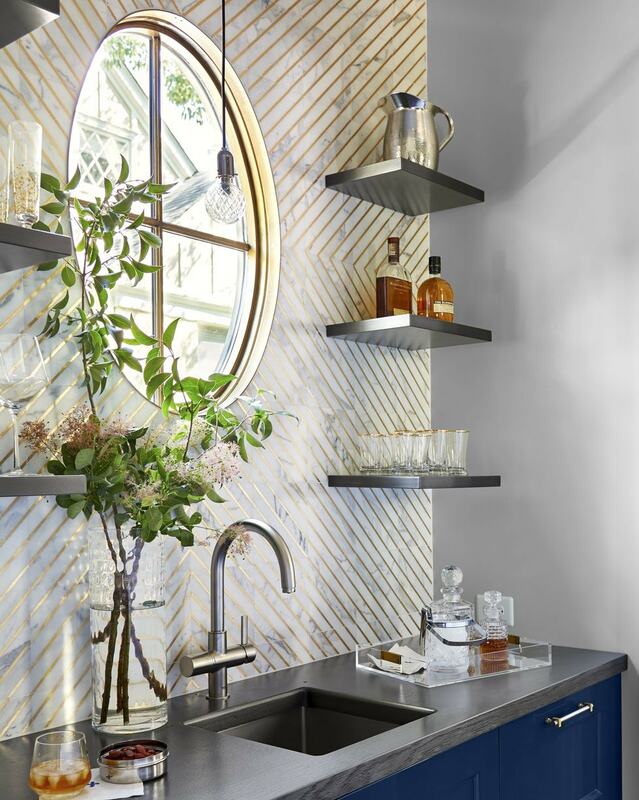 Chevrons create a geometric effect that instantly adds visual interest to the area, especially when the other elements around the backsplash don’t rely on any patterns. To keep a harmonious look, consider the addition of a monochrome chevron style. Adding colorful patterns makes for an extra daring impression that many people won’t like. Using glass is a nice material choice for a kitchen backsplash. 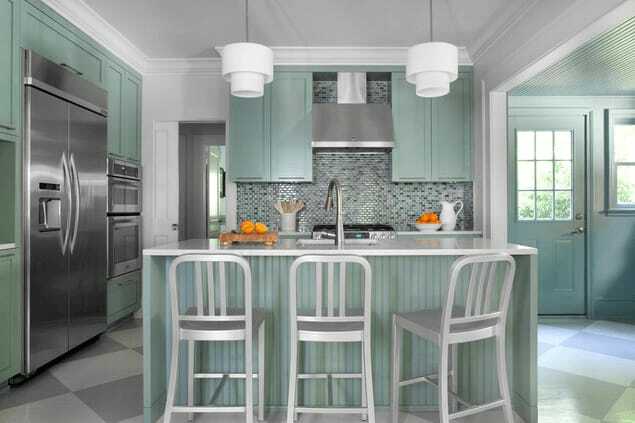 By selecting a piece in a vibrant green color, you can easily transform the kitchen into a more fun place. Even a minimalist kitchen can take advantage of a few pops of color, and this is a solid idea to try considering how glass backsplashes can be installed without too many hassles. They’re inexpensive and simple to personalize while they reflect light for an airy feeling in the kitchen. 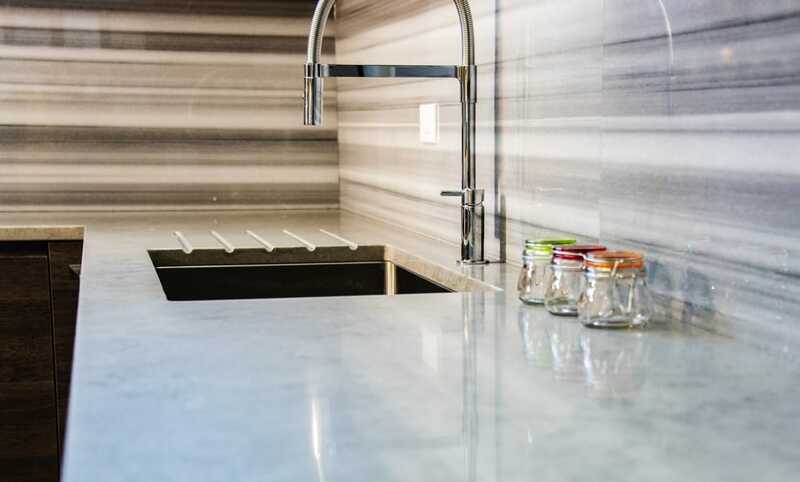 Backsplashes can look amazing when you find the right balance between pattern and texture. 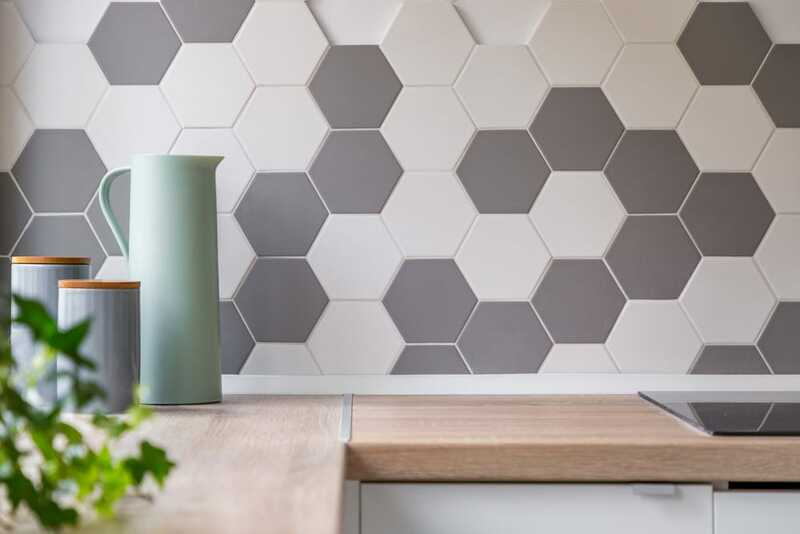 This white and grey honeycomb backsplash is a solid example as it can beautifully complement the look of your kitchen. Having a sparse-looking kitchen represents a great opportunity to spice things up with some playful patterns that seem to interact with other elements in the area. The backsplash of the kitchen can make a stunning statement if you choose a full-color makeover. This is a nice example as the blue backsplash has an eye-catching effect for anyone that comes into your kitchen. While the shade used feels a little cold for this area, the way the surface of the backsplash reflects light boosts the openness of the space. 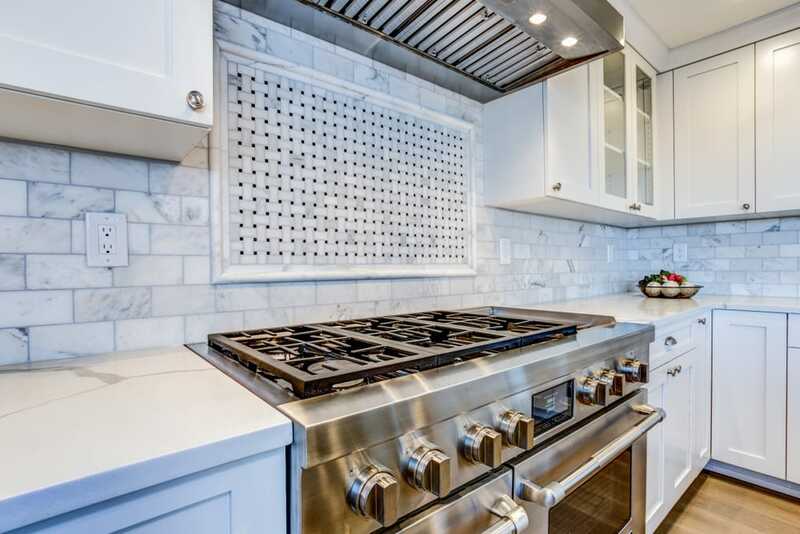 The use of a stainless steel sheet as a kitchen backsplash seems like a great choice if you wish to give off the impression of continuous design. 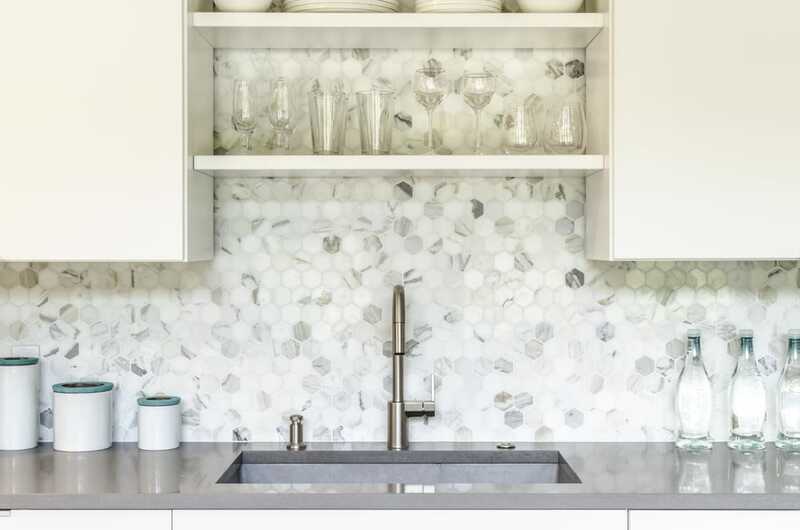 This is a less popular material to use for a backsplash, but you can pull off a successful look with its help considering how lots of elements in the kitchen are also made out of stainless steel. Keeping a consistent color scheme represents an essential interior design aspect. The kitchen makes no exception in that regard. When designing the backsplash and choosing the right colors for it, pay attention to the rest of the elements in the kitchen to maintain a uniform look. If you manage to compliment the colors of the cabinets and appliances, the resulting visual effect will be much more pleasing to the eye. This is a nice example as the blue-gray palette of the kitchen continues through the pattern of the backsplash. Those who enjoy a more traditional look for their kitchens will probably be more reluctant to try out a very colorful makeover. That being said, a dash of color works wonders when paired against prominent neutrals. 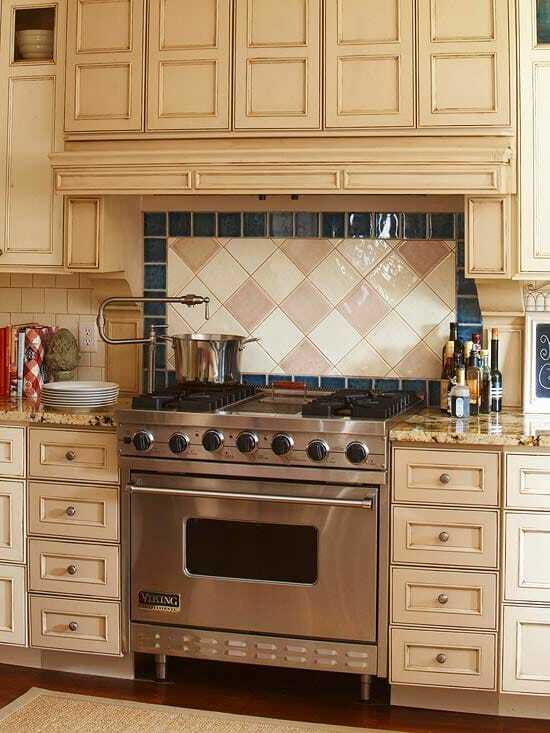 This cream-colored kitchen features a large pattern on the backsplash that blends well with the surroundings. The bold blue tile frame is the true pop of color that captures the attention here. 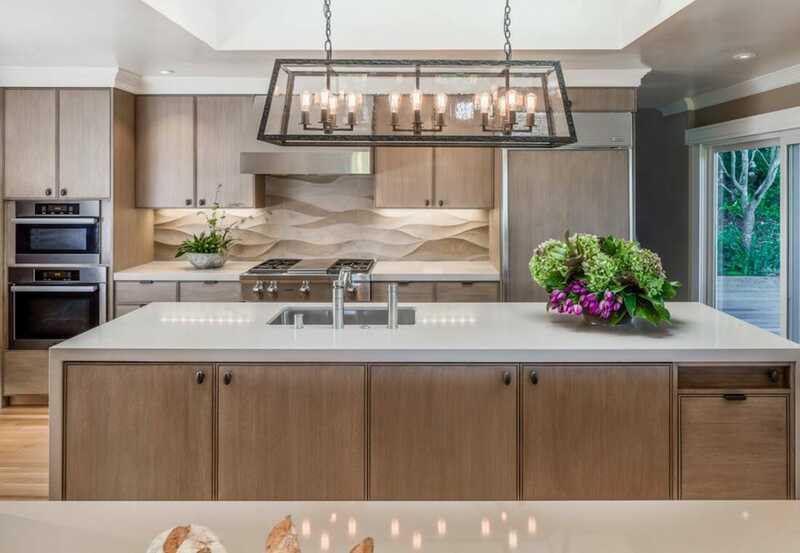 As it’s only a hint of color on the backsplash, the other kitchen elements like the custom cabinetry or granite countertops remain in the spotlight as well. The backsplash serves as a great point of interest for any kitchen. This is why you should maintain a colorful design in this area if you plan on creating a more vibrant look for the entire kitchen. 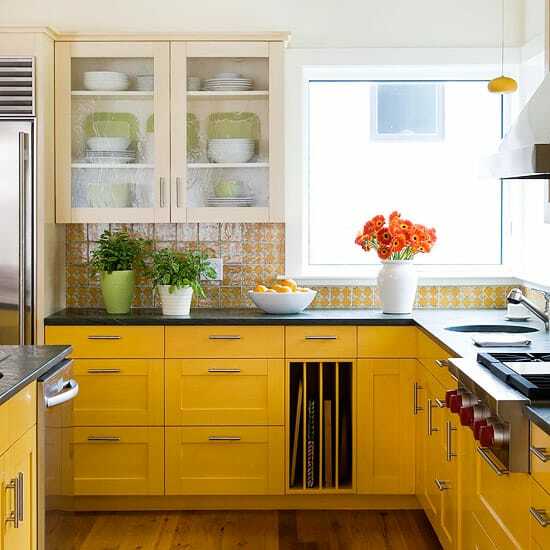 These yellow cabinets offer a perfect match with the backsplash tiles as they both give off cheerful vibes. It’s interesting how the colorful impression follows a gradient from the strong aesthetic of the yellow cabinets to the more subdued backsplash tiles and then reaching a warm off-white for the upper cabinetry. Kitchen backsplashes can look refreshing without the need to rely on vibrant colors. Neutral-looking kitchens can still make use of gentle colors in different hues for a contrast that’s easy on the eyes. While this kitchen has a traditional feel to it, the classic subway tile of the backsplash looks somewhat unexpected with a light green shade. The kitchen backsplash here provides a subtle backdrop that takes your mind to the outside world. A touch of green tends to have that kind of effect, and it seems that it works wonders for kitchens that have traditional-style cabinetry or other classic elements. 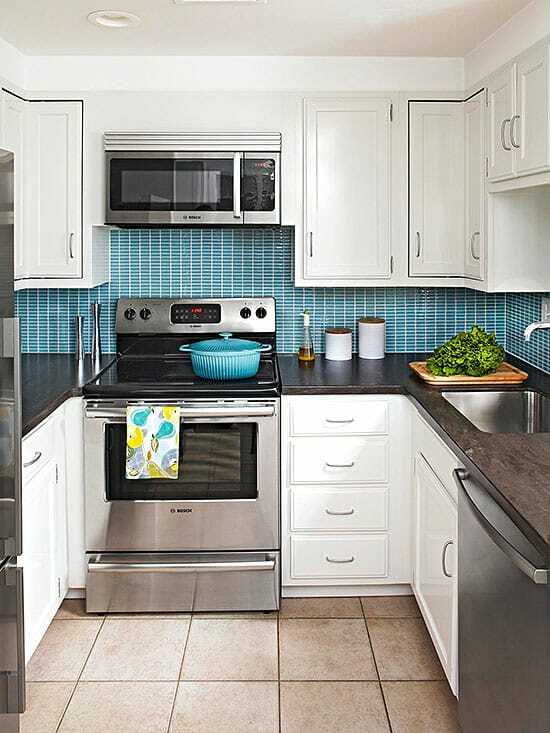 The brightness of the blue kitchen backsplash used here creates a brilliant impact for an ordinary kitchen. There’s often no need to go for complicated kitchen redecorating projects as you can easily breathe new life with the help of a stylish backsplash such as this one. Take a look at the stacked tiles with their distinct electric blue tones. It’s a somewhat surprising choice to have them stacked horizontally. Despite the striking visual impression made by the bright color, the overall look of the backsplash seems very uniform and neat. 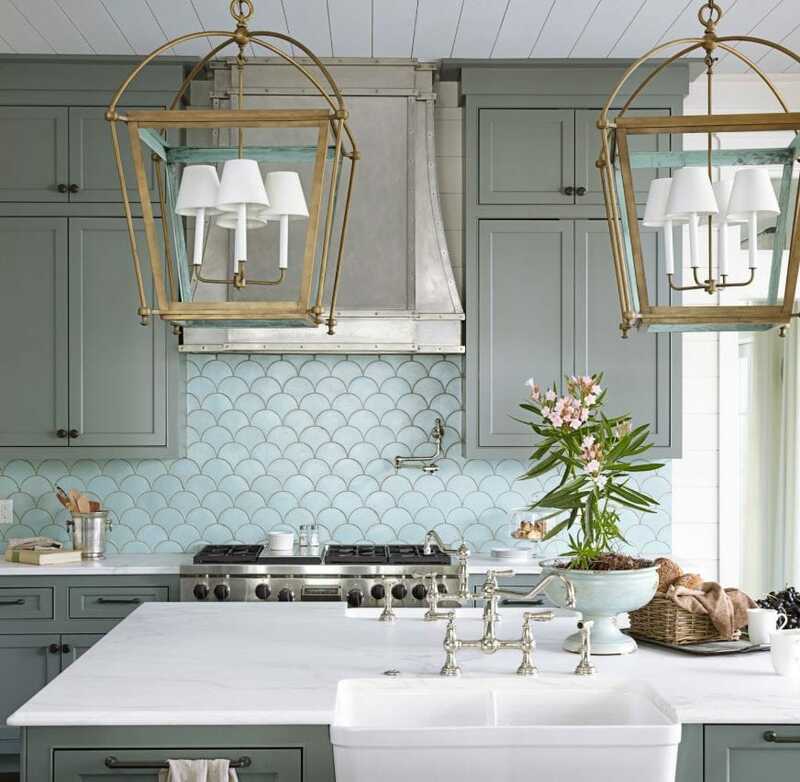 If you wish to bring some coastal style to the kitchen, the easiest way is to choose a design like this fish scale pattern for your backsplash. The pale green color contributes to the eye-catchy design as it can take your mind to mythical creatures such as mermaids. The choice of gray cabinetry seems very inspired for this type of look, but you can also choose other color combinations for decorating your kitchen with some deep sea vibes. If you’re renting or just need a low budget backsplash makeover, we recommend going for removable adhesive tiles. Those who are into DIY projects will probably love the simplicity of these stickers which can be applied without the need for special tools. Here’s a great example from Amazon. The materials used for these adhesive tiles are resistant to mold and heat. They have great decorative potential allowing you to refresh an outdated kitchen in a single afternoon. The kitchen backsplash is an excellent spot to apply these stickers for adding some spice to the space while on a budget. In case you want to be more original, there are lots of ingenious kitchen backsplash ideas that suit you. One of our favorites is to use chalkboard paint which helps to customize the kitchen look and can also serve a functional role. The kids will probably adore this idea as it offers a great entertainment opportunity when they’re waiting for dinner to get ready. 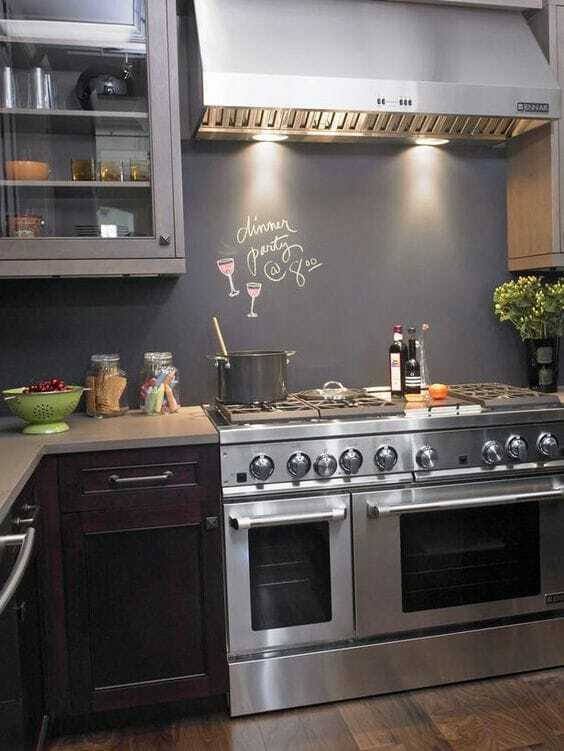 Another great advantage of the chalkboard paint backsplash is how it fits well regardless of your cabinetry style. 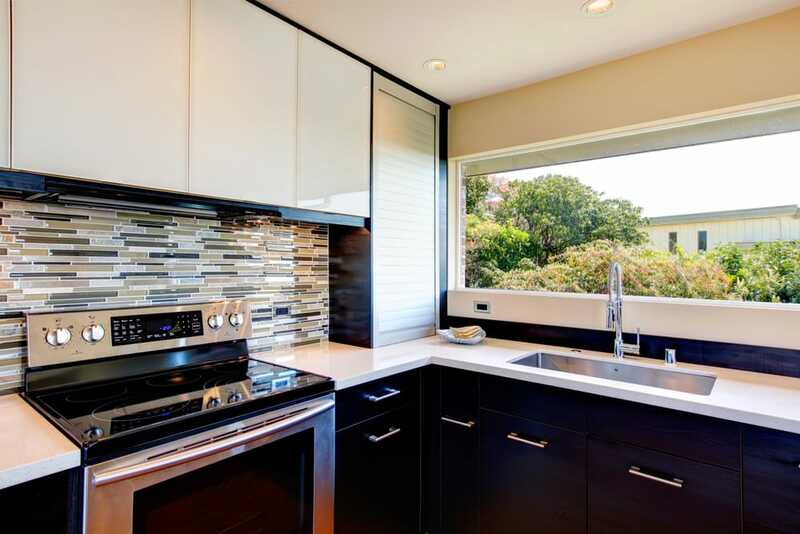 Both modern and traditional options seem to match the sleek design offered by this backsplash idea. Improving the aesthetics of your kitchen is easy if you select a collage design for the backsplash. This artistic look can match the look of any ordinary kitchen while creating a remarkable focal point. To pull off a unique design like this one on the backsplash, it’s strongly recommended to stick to a monochrome look. 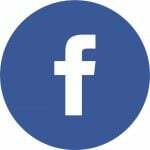 This helps to avoid competing with other elements in the room. Instead of only focusing on patterns and colors, try paying more attention to the role of texture to enhance the look of your kitchen backsplash. Here we have a very elegant example with some attractive wave designs that blend with the rest of the room’s palette. Thanks to the 3D effect of the design, this kitchen backsplash stands out some more when the light goes over its texturized surface. 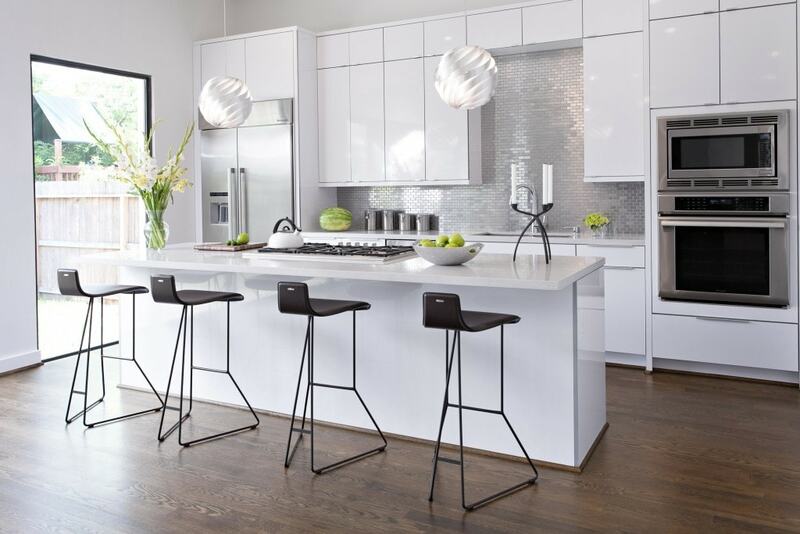 The resulting contrast is subtle but powerful enough to create a statement in this kitchen. If the wave design feels too complicated to pull off, you can also go for raised tiles or similar abstract looks. By using broken pieces of china and tile, you can recreate this vintage look which allows you to express your creativity. This is a solid DIY idea to try if your kitchen works well with cottage-style decorations. It’s also a fairly inexpensive project considering how you don’t need pieces in perfect condition. Look for chipped or slightly damaged china at secondhand stores or garage sales. There are few backsplash ideas more creative than using corks to spice up the look of the kitchen. 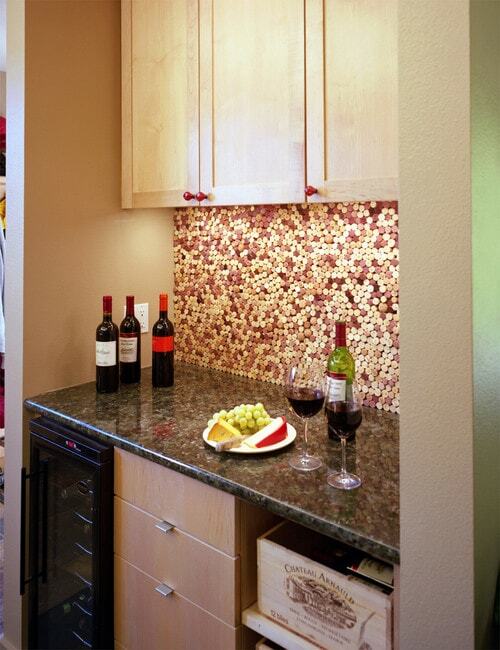 Wine lovers will adore this type of backsplash project. If you don’t know what to do with your collection of corks, perhaps now it would be a good time to try out this idea. When used as a backsplash, the corks create an interesting pattern full of warmth and texture. Reclaimed wood can be successfully incorporated into your home décor if you love the rustic aesthetic. The kitchen backsplash is one area where some lovely wood paneling can make a significant impact. While there’s always the option to rely on backsplash tile and give it a rustic look, the use of real reclaimed wood makes a more striking impression. 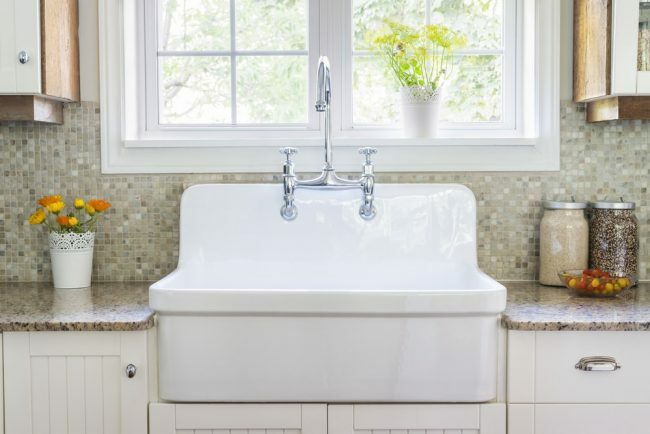 When combined with a deep farmhouse sink, the resulting look is a timeless one, perfect for a rustic kitchen. If you have a concrete countertop, the best backsplash to match it would be one built of the same material. Take a look at this concrete backsplash which has great potential to give this chic kitchen a contemporary feel. 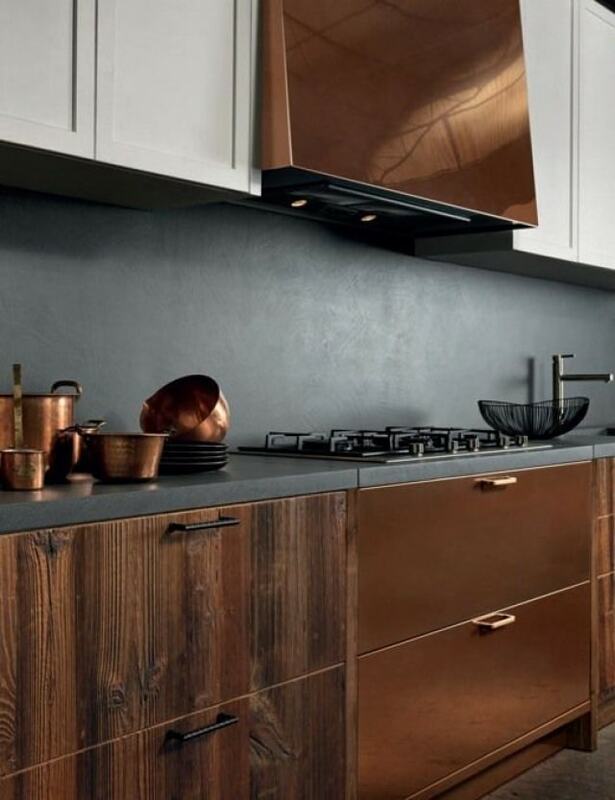 The surrounding copper elements form a superb match to the matte texture of both the countertop and backsplash. This compact kitchen features a mirrored glass backsplash that seems to create the ultimate look of elegance. It contrasts beautifully against the dark cabinets while enhancing the sense of space in the room due to light reflection. The only significant downside of this type of backsplash is that it would be quite obvious when it’s dirty. This means you have to clean it very often because otherwise, even the tiniest specks of dirt will seem highly visible on the backsplash. Gold accents in a sunburst pattern on the backsplash can instantly update the look of any kitchen with some extra oomph. If your kitchen has a modern look with clean lines, the resulting visual effect of this kind of backsplash will be particularly memorable. This elegant arrangement is completed by the cabinets and mixed-metal hardware which together create a sophisticated look. 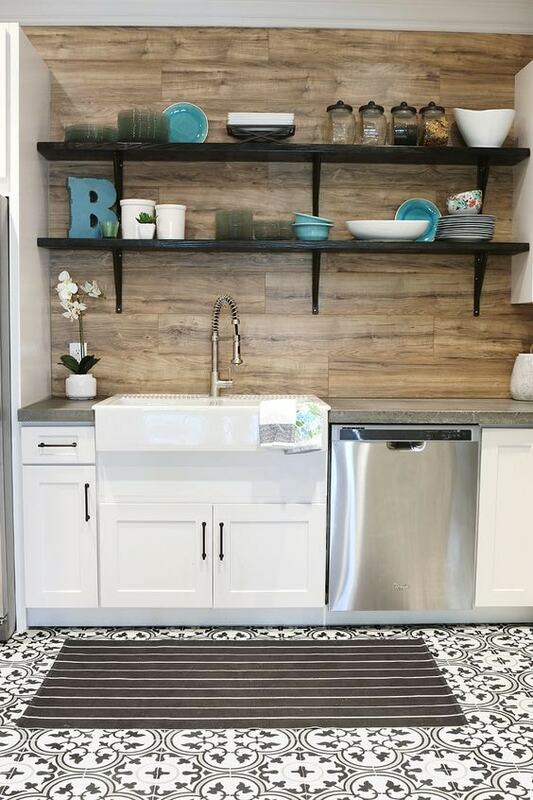 Inexpensive and offering excellent functionality, this pegboard backsplash represents a fine choice if you prefer some extra storage space while compromising on looks. It’s not a difficult backsplash idea to bring to life as you only need to find a basic pegboard and some S-hooks. Then, it’s simply a matter of hanging your favorite cooking tools. 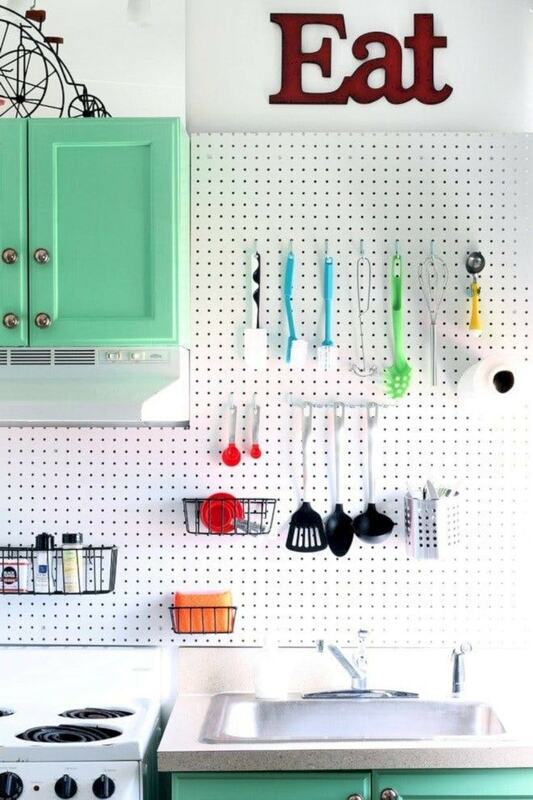 As a bonus, consider painting the pegboard to suit the look of the walls to avoid any glaring differences. Metal backsplashes are usually used in professional kitchens as they’re easy to clean. With some creative design thrown into the mix, any stainless steel backsplash can give off some disco vibes. 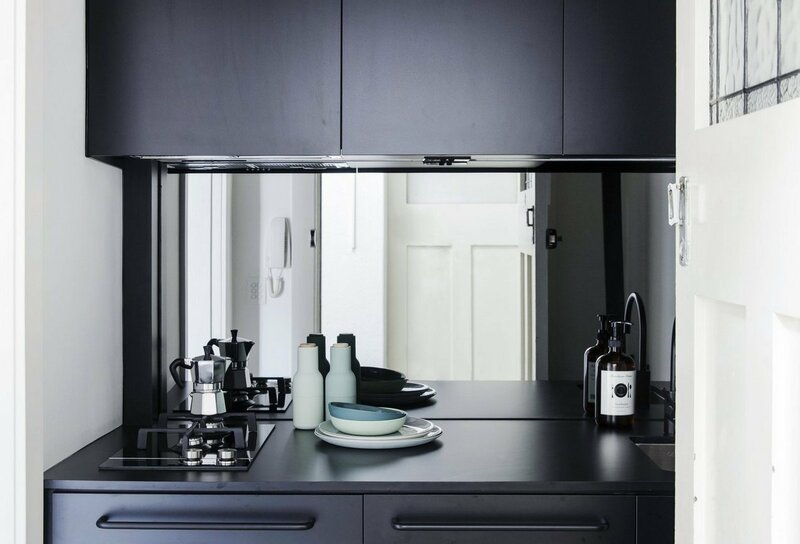 This is a fairly bold look that you can integrate into a modern kitchen without that much effort. The way the metal shines in this kitchen makes for a superb addition if you’re tired of plain subway tiles and wish to try something more daring. The slight industrial feel of the metal backsplash doesn’t feel like it impacts the visual harmony of the room considering the dominant white color scheme.